Another soup recipe! Well, we tend to eat more soups at the moment, since Titus really likes them. This one is from a great cookbook called River Cottage Baby & Toddler cookbook, and it's a very basic and simple soup. Definitely one for beginners in the kitchen - but you can spice it up any number of ways, so don't mistake basic for boring! Good toppings include crispy bacon, croutons, or blue cheese. Feel free to pile on as many toppings as you'd like. Also, add more water or stock if you feel that your soup is too thick, or if you want it even creamier, add a spoon or two of cream. As usual, I didn't completely follow the original recipe - that one had celery in it, too. Add cauliflower and stock or water, which should just about cover the vegetables. Add the bay leaf. Bring to a boil, lower the heat and simmer, covered, for 15-20 minutes. The cauliflower and the potato should be completely soft and cooked through. Remove the bay leaf, and use a stick blender to purée the soup. Season with salt and pepper. Serve with your chosen toppings. 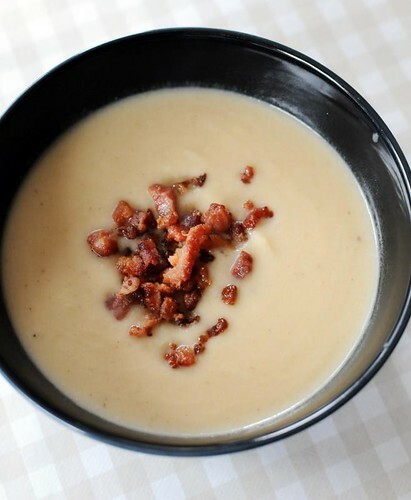 lovely creamy soup without having to add any dairy. A great way to use up cauliflower. Really easy to make. Very tasty and easy to make too. My daughters aged 4 and 1 ate up every last bit (and wanted more! ), a no fuss way of getting them to eat their veg!